It looks like there were 3 instances of clip "A007_C007_0321FO" in the timeline. Once as just the audio and 2 times as the video. If you can remove the audio clip of "A007_C007_0321FO" at 00:01:28:05 and re-edit it back in, that should be the last one of the issues. Please let me know how everything turns out and many thanks for your patience with us. Ok, located those specific clips and deleted. This is the new error message. I guess one is still missing? There seems to be 3 clips that have audio that the timeline references, but the asset listing does not have audio component information for. These are the 3 files that are missing information and that you should try removing from the timeline and re-editing back into the project. Let me know if you try that and how it works for you. Ok, I've now gone through my entire project and removed all files, but it's still flagging one file. Could you read the XML and tell me which one? Or you can tell me how to figure that out. I've swept through all clips 3 times over and can't find it. This is the XML for the whole project. I think it's working! Thank you times one million for the helpful video. I've attached the XML for that first clip and it seemed to convert fine. In the 2 XMLs you sent back it looks like you did the first part right of moving the synchronized clip to its own timeline and detaching the audio, but then you deleted the wrong audio from the timeline. You should be deleting the "A012_C010_0323KP" clip that gets detached, as it is the one that has no audio channels in it (which is causing the problem). The GAMENIGHT audio appears to be fine. I have created a video on the process that I have described for you. Basically, you highlight one of your synchronized clips in the timeline and right click and select "Open in Timeline". Then you will click on your "A012_C010_0323KP" clip and right click on it and select "Detach Audio" and then when it detaches, you select the "A012_C010_0323KP" audio clip and highlight it and then hit your "delete" key. 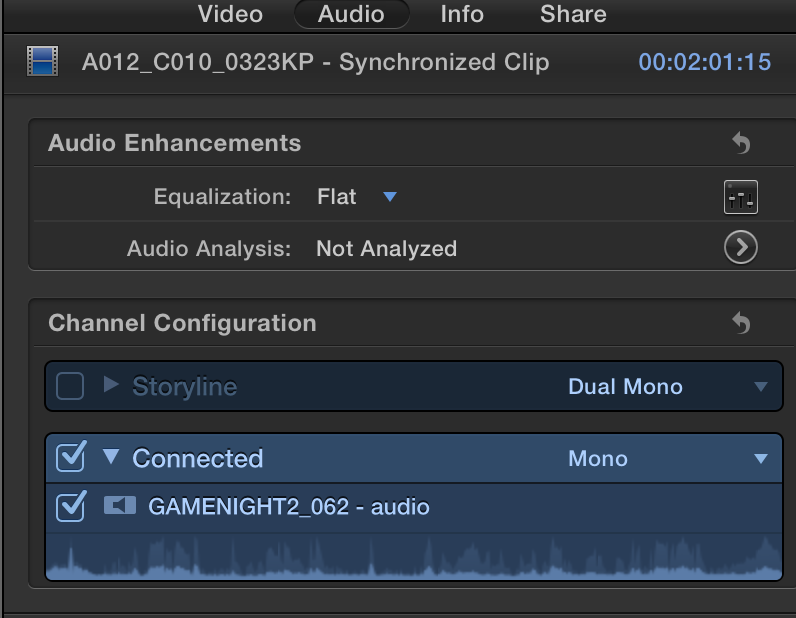 the GAMENIGHT audio should be left with the "A012_C010_0323KP" video clip. Then to go back to the full timeline and continue on through your sequence, you hit the little "left arrow" on the far left corner of the timeline window. Last Edit: 3 years 8 months ago by Jeremy Norwood. Also, could you provide details on the process again? Detaching audio or separating video and audio components doesn't delete anything from the timeline. It just separates things. Its one of the attached below...can't remember which one exactly. Will you provide us with the XML example where you tried the process I suggested, please? I would like to see what the problem is with that one, where the troublesome file should be removed from the timeline. As far as Synchronizing the clips goes, I am working with RED dragon files (R3D) and .wav audio files. I import the clips into FCPX as proxy, then the audio, (so everything is referenced back to a folder on different hard drive), then I place markers on both the audio and video in FCPX. Then I select the clips and hit synchronize. I have to put markers on audio and video because RED footage has no audio to synchronize with and we didn't jam timecode. I ran a test after your last message where I took a clip and detached the audio like you said on a separate timeline, then exported the XML to see what X2AudioProConvert would say and I got the same error message. I'm uploading the first clip of the project. I have to upload the proxy because the full res file is 11GB. We used the portion of the video clip starting at 12:23:18, just to make it easier for you guys. I've also uploaded the audio file that goes with it. Let me know what you find. I don't mind going through and detaching all audio, I just want it t work on the XML for at least one clip. P.S. Tried attaching the files to this page but it seems to not load. Heres the open dropbox folder. I'm aware this is a public forum, so I'm fine with having these clips available. Thanks. We did get your last post and it took us a bit to look through your FCPXML and fully understand what the problem was. The same problem that Graeme reported previously, seems to still be the problem, but instead of it just occurring on the 1 synchronized clip "A012_C010_0323KP", it seems to happen on ever single one of your synchronized clips, or at least the first several that we tried it on. The problem is, the attached audio on your clip shows that it has audio components to it, but then when try to actual view the audio components in the Inspector window, there is no audio components. This means that in the FCPXML in the asset list it shows it with no audio components, but in the timeline part of the FCPXML, it references the file with audio components, which is not correct. 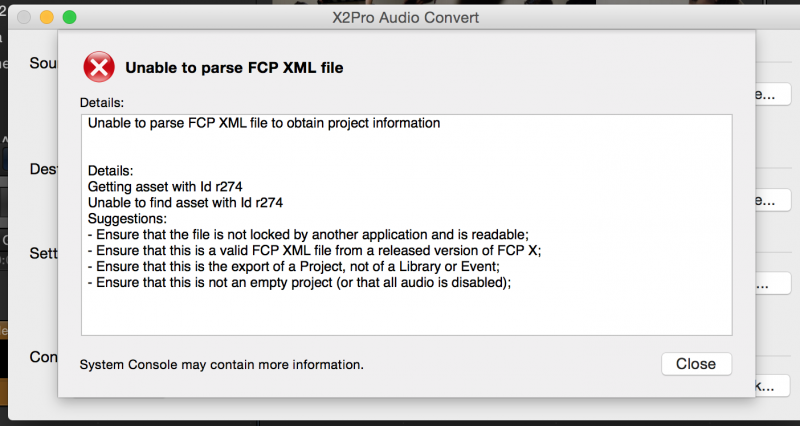 You may be able to try a workaround in FCP X. If you open your synchronized clips in your timeline, you'll see a separate video and audio clip. Now select the video clip and detach the audio from the video part and delete the detached audio. When we started doing this and then re-exporting your XML, we found that the same problem occurred on every synchronized clip, so it would need to be done on every synchronized clip on your timeline. If you could give us the details of how you are going about synchronizing your clips together and possibly supply us with one of your Red and audio files for us to try to reproduce the issue in our lab, it may allow us to understand what is causing FCP X to reference the media in the FCPXML like it is. Did you get my last post below? I deleted that specific clip "A012_C010_0323KP" which was in fact my first clip of my timeline/project and ironically the last thing we shot. I also deleted the audio. I realized after deleting the audio clip and while trying to re-import, that that one audio bite is the one that was located in a different location than all the other audio. I put my audio clip in the folder with all other audio. Then reimported. I then re-synced the video and audio clip, re-exported the XML and tried it again. Still getting the same message from X2Pro. Here is the current project XML and screen grab. It is, by the way, showing normal channel configuration in my view of FCPX. Everything looks totally normal. I am going to attach a screenshot of that too. The "storyline" is turned off, but that is normal because it's a red clip, which has no audio. All my other synced clips look like this. When I try to open your fcpxml, I get a similar error, but instead of a problem with asset "r274", I get a message about asset "r4". In fact there is not an asset "r274" in the fcpxml that you provided, so I assume the screen grab is from a different fcpxml. 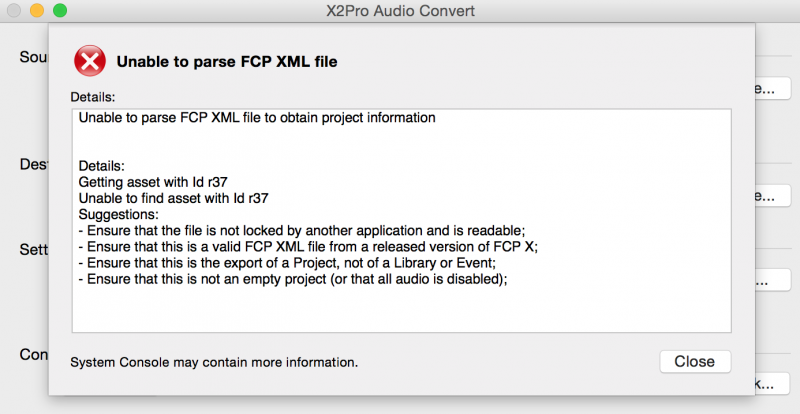 The issue with asset r4 in your fcpxml is caused by your fcpxml not containing the necessary information in the section where it lists the clips that are used in your project. Asset r4 is the video clip called "A012_C010_0323KP" which is part of the synchronised clip at the start of the project. I don't know how FCP has created an invalid fcpxml like this, but if you import it back into FCP and look at that clip in the inspector, you will see that it has an audio tab, but the channel configuration section is empty, which shouldn't be possible (if there is an audio tab, there must be some channels of audio). This indicates the FCP doesn't really know what to do with this fcpxml either. As a workaround, could you try removing that clip from your project and putting it back in? This may be enough to get FCP to create a valid fcpxml. I'm having the exact same issue. 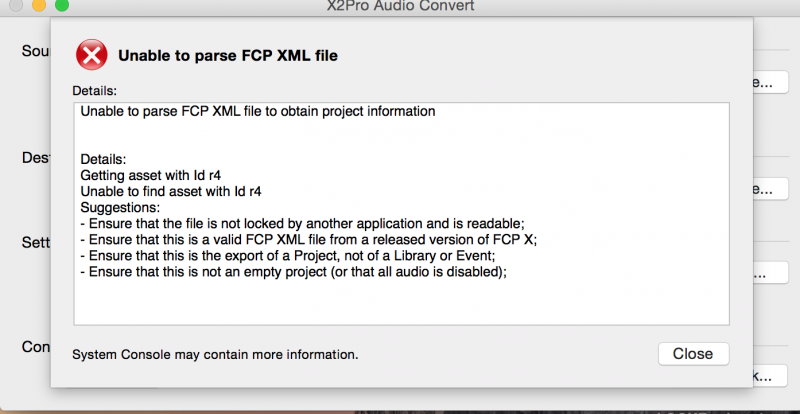 Attached is the screenshot of my error message and the FCP XML for my project.